Girls outperform boys in HSC results as Year 12 results come out. Girls again dominate in top HSC spots as results released for high achievers. Girls have taken out top positions in most HSC subjects in New South Wales including in the male-dominated fields of automotive and primary industries. 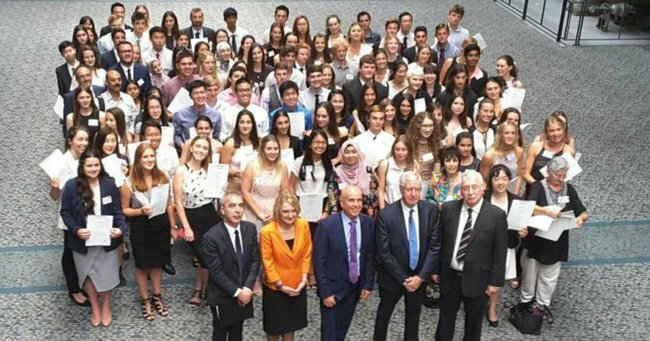 One hundred and sixteen students received first in course awards from the Education Minister Adrian Piccoli during a ceremony in Sydney today, with six of the students topping two courses. Parents, carers, teachers and friends watched on as the certificates were presented to 82 girls and 34 boys. The breakdown between private and public schools was about even. Grace Parker from the Dubbo Christian School came equal first in automotive examination with Jack Cutler from the New England Institute in Tamworth. Grace and her twin sister were one of three girls in the class of up to 30 kids at the Western Institute, she had she had to persist to get into the class. Grace said that once she got in, everybody was supportive. Claudia Nielsen from Calrossy Anglican School topped the primary industries examination. “I am really passionate about agriculture and the industry”, the Tamworth student said. Along with her studies, Claudia also runs a cattle stud which she has been operating with the support of her parents since she was seven. She plans on taking a year off and then study a Bachelor of Science. “I definitely enjoyed growing up on the land and experiencing the rural lifestyle, it’s really beautiful out there, defiantly make a living out of it,” Claudia said. Her father Geoff is an agriculture teacher and travelled to Sydney for today’s presentation, and said he was pleased with his daughter’s efforts. “Extremely proud, Claudia worked really hard throughout the entire year,” Mr Nielsen said. Girls also dominated English subjects but boys had a strong showing in mathematics. Rowan Faint was one of four students that came first. The Penrith Anglican College student is actually in Year 11, but was accelerated up a year in mathematics. He told the ABC that he loves maths but was surprised at what he achieved. Burwood Girls High School friends Qisthy Kodarusman and Chau Le were flanked by family at today’s awards ceremony. Qisthy came first in heritage Indonesian which she studied through the Open High School and Chau Le topped Vietnamese continuers which she pursued through the Saturday School of Community Languages. Qisthy, who was also school captain, said she had a lot to juggle this year. “Very surreal, I really did not expect it but I am very happy,” she said clutching her certificate. Qisthy received an offer before the HSC, for a leadership program at Western Sydney University where she will study international studies, he hope is for a career in an NGO or the diplomatic field. Chau is banking on a good outcome tomorrow when the HSC results are released. “I am looking forward to going to Sydney University and doing a Bachelor of Advanced Engineering and Biomedical Engineering,” she said. Both girls are also hopeful of good results tomorrow for their friends. “Very nerve-racking, obviously we want best results for ourselves but we also wish good luck for all students in Year 12,” Qisthy said. Mr Piccoli paid tribute to the students. “It is an incredible achievement, 68,000 students will receive an HSC this year and today we recognise those 100 or so students who have topped individual courses,” the minister said. HSC results will be available online or via SMS from 6:00am tomorrow. The Board of studies, Teaching and Education HSC Inquiry Centre 1300 138 323 will operate from 8:00am for students with questions about their results.